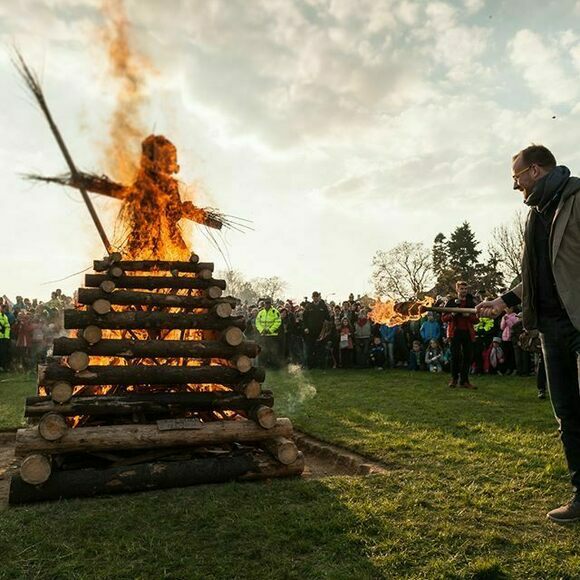 On April 30, people all over Czechia gather to play games, drink beer, roast burty sausages, and burn witch effigies at the stake. Čarodějnice is Czechia’s version of Walpurgis Night, celebrated across Northern and Central Europe. While Čarodějnice is observed throughout Czechia, the most happenin’ place to celebrate the festival is Ladronka Park in Prague, where thousands gather to banish black magic and welcome spring, all while enjoying a menu of Czech fried bread, pastries, and fire-roasted meat. Walpurgis Night is the evening before May 1, Saint Walburga’s feast day to some cultures (in others, it’s February 25). Born a British noble in the early eighth century, Saint Walburga (also spelled Walpurga) became a nun, migrated to Germany, and was instrumental in converting Germans to Christianity. Germans believed that witches met every year on the Brocken, the highest peak of the Harz mountains, for Hexennacht, when they’d exchange some serious black magic. Once Christianized, Germans prayed to St. Walburga to protect them on Hexennacht. As faith in Walburga spread across Europe, pagan rituals surrounding witchcraft and Catholic beliefs in the intercession of saints merged into a hybrid holiday. During these celebrations, Christians burned effigies of witches to cast out black magic, but they also indulged in a number of pre-Christian traditions, such as offering bread with butter and honey to satisfy evil spirit hounds. Nowadays, revelers celebrate Čarodějnice with less superstition and a lot more kitsch. At Ladronka Park in Prague, children compete in witchy costume contests, families listen to live music, and sausages bubble on sticks. Festival organizers provide the burty and the roasting equipment, as well as smaller fires for the roasting. Stalls offer langoš (fried bread with savory or sweet toppings), frgál (a pastry covered in jam and crumbs), and baked potatoes. While fear of dark magic is a thing of the past, some old Čarodějnice myths do have staying power. Legend has it that if a young woman doesn’t find someone to kiss under a cherry tree by midnight on Čarodějnice, she won’t find love for a year. (The jury is out on whether young people actually believe this, or just want an excuse to make out.) While more than a millennium has passed since medieval Germans first beseeched St. Walburga to protect them on Hexennacht, celebrants at Čarodějnice still burn a witch’s effigy in a huge communal fire. And people still cheer when a particularly dense burst of soot burps from the fire, signaling that another witch has just gone up in smoke. Admission is free, and witchy costumes are welcome. These pull-apart rolls were once baked with lottery tickets in the center. The sweet-and-sour soda almost disappeared with the collapse of communist rule in then-Czechoslovakia. Some families keep their holiday meal fresh by letting it live in their bathtub. No Bonfire Night is complete without a cup of this warm, vinegar-flavored snack. Celebrate the harvest and the return of a beloved mythical king with this 26-dish Malayali feast. This Galician punch is set aflame to ward off evil spirits.